Biological Science 5 Edition Supports and motivates you as you learn to think scientifically and use the skills of a biologist. 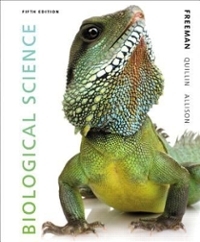 Scott Freeman’s Biological Science is beloved for its Socratic narrative style, its emphasis on experimental evidence, and its dedication to active learning. In the Fifth Edition, the author team has expanded to include new members —bringing a fresh focus on accuracy and currency, and multiplying the dedication to active learning by six. Research indicates that true mastery of content requires a move away from memorization towards active engagement with the material in a focused, personal way. Biological Science is the first introductory biology text designed to equip you with a strategy to accurately assess your level of understanding, predict your performance, and identify the types of cognitive skills that need improvement.